Level entry ramps are a relatively new idea that provide a level platform for a wheelchair user to be on while accessing a doorway that has a raised threshold. 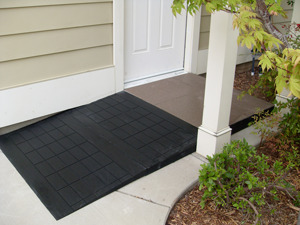 Normally users would purchase a threshold ramp that would allow them to roll up to and over a threshold smoothly for entry but if they are alone and trying to manage a locked entry door, and possibly a screen outer door, being on a level surface will make the process easier and safer. 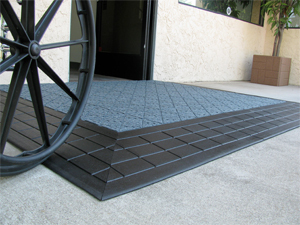 The pictured Entrylevel™ Wheelchair Ramps from Safepath Products are made from recycled rubber that can be cut to size for custom fitting to almost any entrance way. So basically, a level entry ramp system is a flat platform that raises the floor level to the threshold level and provides a sloped access to that level. The platforms will have to be available in many thicknesses or there must be some way to adjust the thickness to meet the height required. The sloped access surfaces will be different lengths, or widths depending how you look at it, in order to provide a minimum 1:12 slope (12" of slope per 1" of rise). Because of these two variations the amount of space required to install a system will vary. The level platform needs to be large enough for wheelchairs to completely access and move around as needed while manipulating the door. It's recommended that there is 24" of level platform extending past the strike side of the door. While I haven't been able to find any accessibility regulations in Canada that require a level access to buildings, these regulations are now in place in the United States. Being that the U.S. and Canadian regulations seem to mirror each other in many areas, I wouldn't be surprised to see the requirement of a level entry to businesses appear in Canada in the future. Regardless of whether level entries are regulated or not, it is something business owners will want to consider for the safety and convenience of their visitors and customers that suffer mobility related restrictions. Ideally, when new buldings are constructed, or maodifications are made to existing entrances, level areas in front of the entrance will be part of the plan. 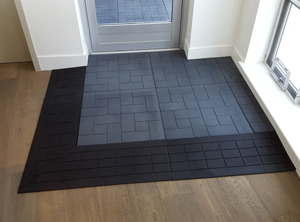 For businesses that need to make changes to their entry they can build up the concrete to provide the level platorm area and slope the concrete down to the original level around the edges. Another option might be to build up the concrete in the entry and use threshold type ramps to access the raised area. I suppose that the platform could even be constructed of wood and the sloped areas could be wood or conventional threshold ramps but this option may create difficulties in securing the components in place and rotting over time if exposed to the weather.